At least one-third of the people we know are introverts. They are the ones who prefer listening to speaking, reading to partying; who innovate and create but dislike self-promotion; who favor working on their own over brainstorming in teams. Although they are often labeled "quiet," it is to introverts that we owe many of the great contributions to society; from van Gogh’s sunflowers to the invention of the personal computer. 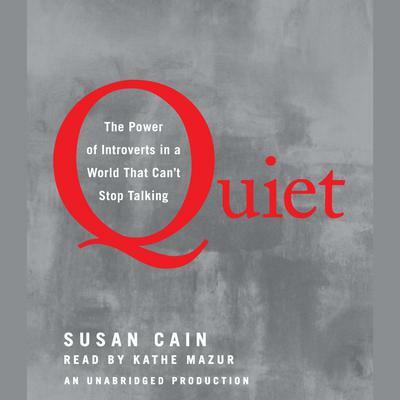 Perhaps most inspiring, she introduces us to successful introverts—from a witty, high-octane public speaker who recharges in solitude after his talks, to a record-breaking salesman who quietly taps into the power of questions. Finally, she offers invaluable advice on everything from how to better negotiate differences in introvert-extrovert relationships to how to empower an introverted child to when it makes sense to be a "pretend extrovert." Susan Cain was a corporate lawyer for seven years before she became a writer. She represented clients like Goldman Sachs and General Electric, but then started a negotiation consultancy. In this company she trained all kinds of people, from hedge fund managers to TV producers to college students negotiating their first salary. However, Susan realized she was neglecting her most valuable asset of all, being an introvert. From there she decided to become a writer. She is the author of the bestselling book, Quiet: The Power of Introverts in a World That Can’t Stop Talking and just recently published Quiet Power: The Secret Strength of Introverts. Cain attended Princeton University and Harvard Law School. She currently lives in Brooklyn with her husband and sons.